Appliances Repairs in and Around the New Hope Alabama area to include Sears Repair, LG Repair, Maytag Repair and All Other Major Brands. We provide home appliance repair service to the New Hope Alabama and surrounding areas. We charge only $60.00 for the service charge. We provide refrigerator repair, oven repair, range repair, microwave repair, freezer repair, washer repair, dryer repair, garbage disposal repair and all other appliance repairs in the New Hope Alabama area. The city of New Hope is very small and in most cases the people there have to go to Huntsville Alabama to take care of all of their everyday needs. I am from New Hope so I wanted to offer an appliance repair service that would help the citizens of New Hope to save money and time. Here at Appliance Masters we service the whole county of Madison for just a 60 dollar service fee. We understand that most appliance repair companies will charge you more than 100 dollars just to show up at your home. Then you will likely get charged another 100 dollars for the labor. We offer an affordable appliance repair service that won’t leave you broke and will leave you knowing that the job was done right. We service all appliance brands as our technicians have more than 16 years of qualified experience. We work from 9am to 9pm 7 days a week for your convenience. Please go to our online reviews and take a look at what our past customers have to say about us. Our reputation speaks for itself. We have always made sure that our appliance repair customers our happy before we close out their jobs. We take pride in always doing the right thing when it comes to our customers. We realize that our business would be nothing without the customers that we service. 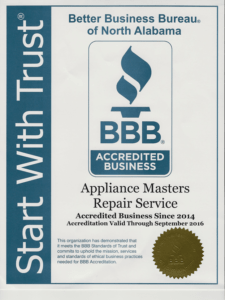 With our ongoing training, experienced technicians, great attitudes, moral aptitude and affordable prices you should give us a call for all of your appliance repair needs. We are trained to service all brand and ages of refrigerators, freezers, washers, dryers, dishwashers, garbage disposals, ranges, ovens & range hoods.